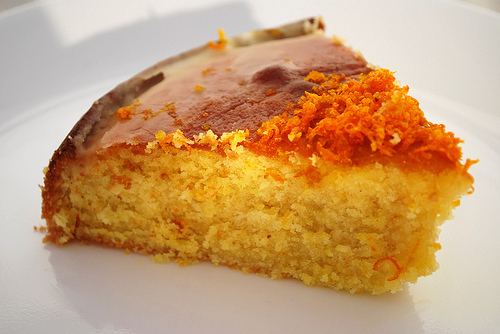 This is a delicious, easy-to-make cake, with a moist texture and a super zesty tang. I don't do many desserts, but this is a winner! Butter a 10-inch round cake pan (a low-sided springform pan with removable sides is ideal). In a large bowl, mix together the sugar, the breadcrumbs, the almonds, and the baking powder until well blended. In a smaller bowl, whisk the eggs together with the oil, and pour the mix in with the dry ingredients. Add the orange and lemon zest and the orange flower water, and mix well. Pour the batter into the cake pan, and place it in a cold oven. Turn the heat to 350 degrees, and bake until the top is golden and the cake feels firm, about 40 to 45 minutes. Let cool for about 15 minutes. In the meantime, put all the ingredients for the orange syrup into a small saucepan, and give them a stir. Turn the heat to medium-high, and let the sauce bubble and reduce for about 6 or 7 minutes. Let the syrup cool for about 15 minutes. Run a knife around the sides of the cake, and unhinge the pan. Slide the cake onto a flat serving platter. Poke a bunch of tiny holes in the top of the cake with something skinny and sharp, like a barbecue skewer or a toothpick. Slowly pour the syrup over the cake, letting it soak in. If too much syrup pools up around the cake, just spoon it over the top again. Let the cake sit for about ½ hour to further soak up the syrup before slicing.